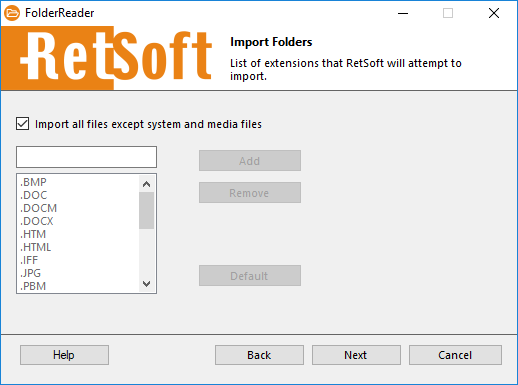 Learn how to import an existing folder stucture into RetSoft with a few simple steps and improve your search results immediately. If you are like the thousands of companies that work via a shared network drive you might want to import the entire shared folder into RetSoft. This way all the files you need to find will be indexed by RetSoft, thus enabling you to use the search power of RetSoft to find those documents you need. 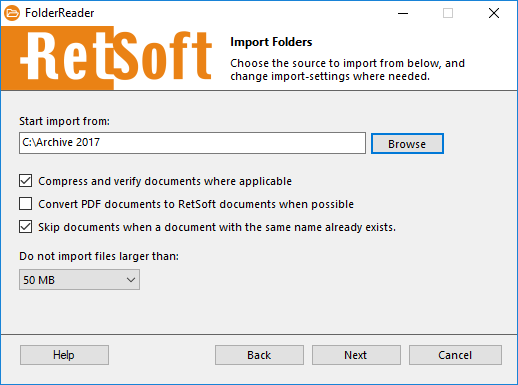 You can choose to import these files and still create a new structure for every document you want to add to RetSoft after this initial import. So you are not forced to keep working in the structure you are working with on you network drive. If you use this in Trial mode, there is a limit on the amount of files you can import, this limitation is lifted after you purchase a license. Using folder reader is pretty straight forward, you specify which folder you want to import and which options you want to use during that import. 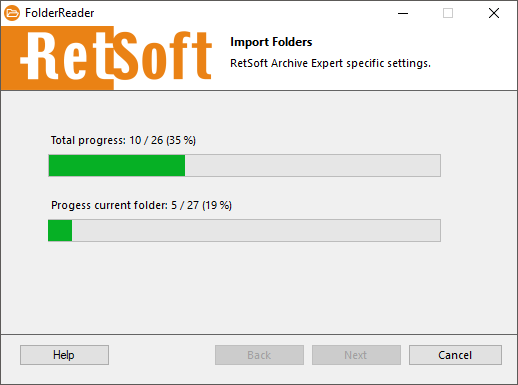 This option checks the files supported by RetSoft Archive and compresses them before importing them into the archive. If you want to keep the file in its original file, uncheck this option. When possible PDF documents will be converted to RetSoft documents. 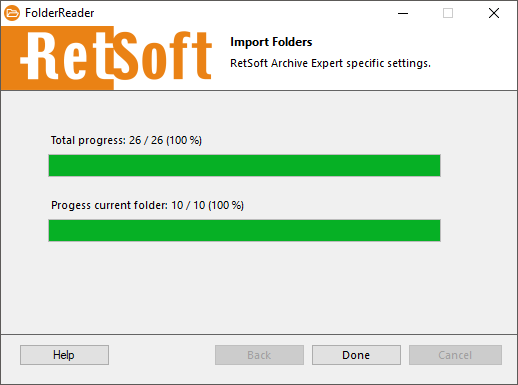 RetSoft documents are optimised for usage in RetSoft. They can be edited, such as split pages, merging pages, and reordering pages. They also load faster when viewing them inside RetSoft. Files that are larger than the specified value will not be imported. In this screen you can choose which file formats you like to import. You can add and delete file formats here in and out your list. With the ‘Default’-button, you can restore to the default formats that are supported out of the box by the program by default. File types not support by RetSoft may be imported but can’t be viewed inside RetSoft and indexing of the document will not be possible. To view the file you can double click the file and open it in an external viewer. In this folder you will set up the settings to add metadata (names, keywords, etc.) to imported documents. 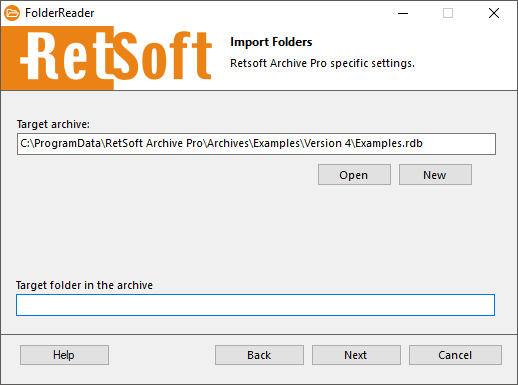 When a file format is not recognised by RetSoft Archive, the file extension will be added to the name of the document in your archive. When this option is unchecked, RetSoft will search for it while importing. See in sub-section ‘Metadata files’ later in this manual for more details. When there is no date inserted in the metadata of the file, the system date of the file will be used. In all other cases the current date will be used. Locate your archive database in which you want to import the folders and files. If you want you can also input a target folder where the import should be placed in. If the target folder doesn't exist it will be created. After all folders and files are imported you can finish by clicking on Done. If there were any problems during to import a log file will be shown. 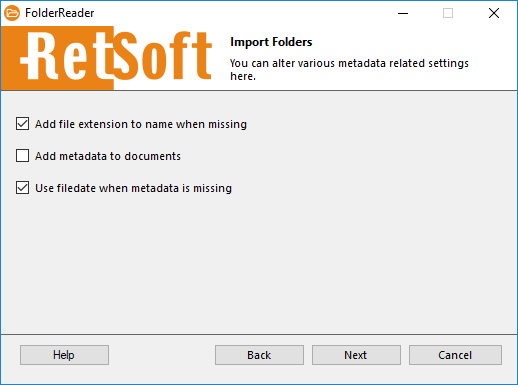 If you are moving your file from a different archiving solution and you want to import metadata from that solution in to RetSoft, that is also possible. If you want to do this you can find more documentation about how to do this in our manual.